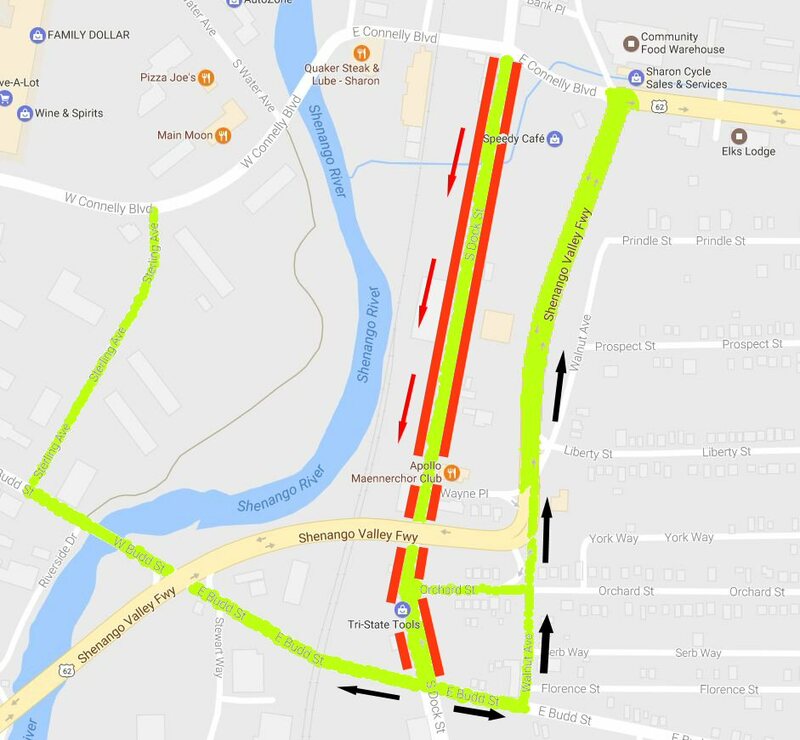 Starting Monday, March 27, South Dock Street will be closed to northbound traffic for PennDOT’s road construction project. 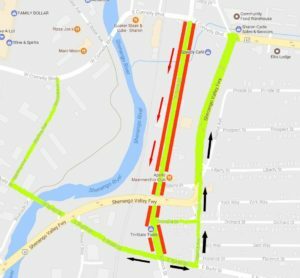 As some of you have already experienced, over the past 3 years PennDOT has been slowly but steadily renovating the Route 718 corridor starting in Wheatland, continuing on through Farrell and Sharon, and it will eventually end at the intersection of S. Dock St. and Connelly Blvd. behind the Herald building in downtown Sharon. Finally, it’s our turn to be “under construction”, and we anticipate being on a “one-way street” until the month of October. What does this mean to the Club and our members? On the positive side, as we’ve seen happen in Wheatland and Farrell, there are going to be many cosmetic and infrastructure improvements to a stretch of road that’s needed it badly for a very long time. In front of the Club and all along S. Dock we’re going to see new curbs, new sidewalks, new streetlights, new utilities, a nice new road surface devoid of bumps and potholes, and an overall improved cosmetic appearance of the entire area. This will be a great benefit to the Club, the neighborhood, this stretch of road, and the City of Sharon in general. On the negative side, there will be some detours and re-routing of traffic that will create some minor inconveniences for our members either entering or exiting the club depending on which direction you’re coming from. Luckily, unlike the detours Wheatland and Farrell businesses had to cope with, our detours are short and “just around the block”, if even. We’re going to explain the routes, and attach maps to this email that you can refer to which will make your visit to the Club simple and as less inconvenient as possible. You will be able to follow Rt. 718 (Wheatland-Farrell corridor) as always, UP UNTIL THE TRAFFIC SIGNAL AT THE INTERSECTION OF S.DOCK ST. AND BUDD ST.
S. Dock St. will be closed to northbound traffic at Budd. St. by Sunbelt Transformer just before the Rt. 62 overpass. This is less than 200 yards from the Club, but you won’t be able to go any further. Turn right at the light onto Budd St., travel one short block and make the first left onto Walnut St., continue on Walnut past Orchard St. and merge onto Rt. 62. Immediately after merging onto Rt. 62, make the first right into the traffic delta just past Phil’s Auto Sales, and making a quick left in the traffic delta, you’ll be able to cross Rt. 62 in the opposite direction and turn onto Wayne Place and enter our parking lot from the rear. Exiting the Club will be as it always was for you with no detours. See the “From the South or Ohio” map below. If you normally come in from Rt. 62 from the PA/OH line and turn right onto Budd St. at the intersection of Rt. 62 and Budd (just past the sewage treatment plant), you will have to stay on Budd St. PAST S. Dock for one more short block, and make the first left onto Walnut St., continue on Walnut past Orchard St. and merge onto Rt. 62. Immediately after merging onto Rt. 62, make the first right into the traffic delta just past Phil’s Auto Sales, and making a quick left in the traffic delta, you’ll be able to cross Rt. 62 in the opposite direction and turn onto Wayne Place and enter our parking lot from the rear. Another option which may be even more simple is to remain on Rt. 62, and immediately after rounding that 90 degree bend to the left, make the first right into the traffic delta just past Phil’s Auto Sales, and making a quick left in the traffic delta, you’ll be able to cross Rt. 62 in the opposite direction and turn onto Wayne Place and enter our parking lot from the rear. You will be able to enter the Club as normal, either via S. Dock St. or Rt. 62 (rear entrance access into our parking lot from Wayne Place). Leaving the Club you must turn left (south) onto S. Dock. St., go under the Rt. 62 overpass, and make an immediate left onto Orchard St. (if accessible?) or Budd St., travel one short block and make the first left onto Walnut St., continue on Walnut past Orchard St. and merge onto Rt. 62. Take Rt. 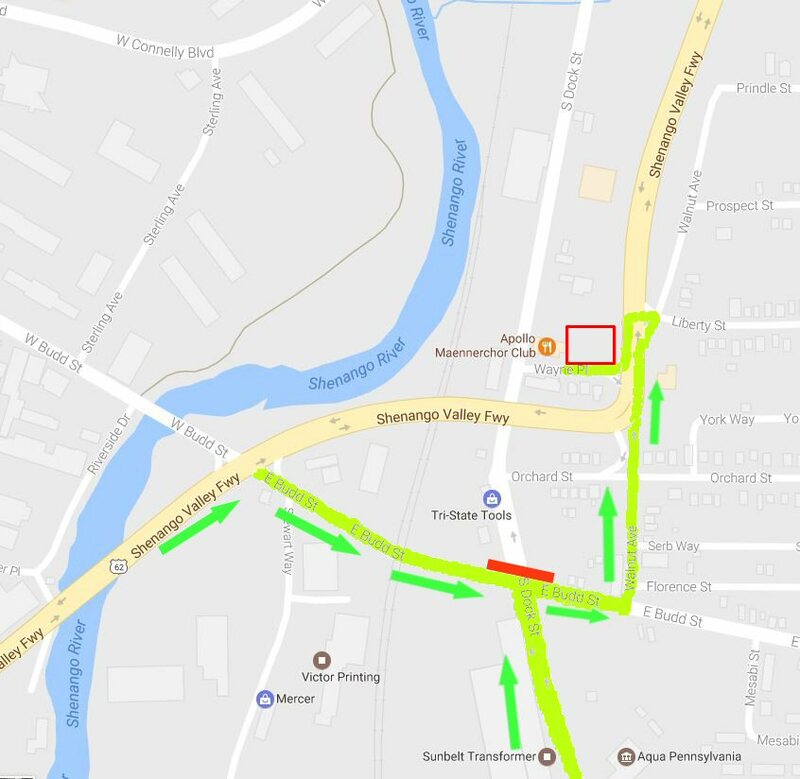 62 to the intersection of Sharpsville Ave./Connelly Blvd./Shenango Valley Freeway to go home. If heading toward Ohio via W. State St. (West Hill), after leaving the Club and making a left onto S. Dock St., you can make a right on Budd St., cross Rt. 62, and across from Calvert Lumber make a right onto Sterling Ave. which will take you to Connelly Blvd. and downtown Sharon near the Sharon Municipal Building. See the “From the North” map below. In conclusion, we hope this information is helpful to you, and although we’re excited by these positive changes to the neighborhood, we also recognize that even the slightest inconvenience to customers has the potential to negatively affect business. For this reason, we’re asking our members to be extra supportive in the months ahead in making the Club a regular destination. We continually strive to improve in all areas by offering good food, good drinks, and good entertainment for a reasonable price. We have many events and quality entertainers scheduled for the upcoming months, including Maifest, the National Buttonbox Festival over Memorial Day weekend, the Waterfire events, a summer Blues Festival, and more! As always, we appreciate your ongoing support and patronage.